Figure 1-10. 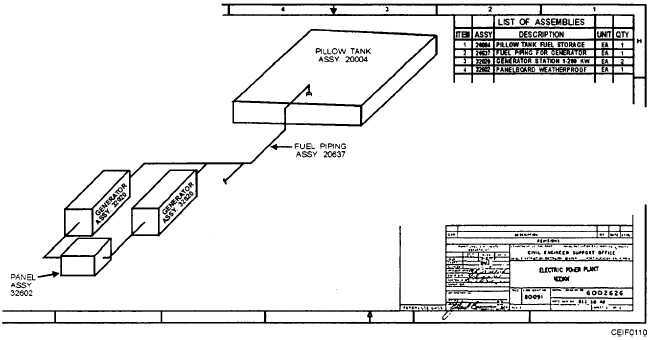 - Layout drawing for a 400-kilowatt electrical power plant. Network analysis has many advantages. As a management tool, it readily separates planning from scheduling of time. The diagram, a picture representation of the project, enables you to see the interdependencies between events and the overall project to prevent unrealistic or superficial planning. Resource and time restraints are easily adjustable to permit changes in the plan before its evaluation. Because the system splits the project into indi- vidual events, estimates and lead times are more accur- ate. Deviations from the schedule are quickly noticed. Manpower, material, and equipment resources can be easily identified. Since the network remains constant throughout its duration, it is also a statement of logic and policy. Modifications of the policy are allowed, and the impact on events is assessed quickly. Identification of the critical path is useful if the completion date has to be advanced. Attention can then be concentrated toward speeding up those relatively few critical events. The network allows you to accurately analyze critical events and provide the basis for the preparation of charts. This results in better control of the entire project. The only disadvantage of network analysis as a planning tool is that. when attempted manually, it is a tedious and an exacting task. Depending upon just what the project manager wants as output, the number of activities that can be handled without a computer varies, but the number is never high. If calculations are in terms of the sequence of activities only, a project involving several hundred activities may be attempted manually. However, the chance for error is high. The time required for manual operation would become costly. Various alternative plans also may be impossible because of the large volume of work. On the other hand, a standard computer program for network analysis, CBCM 2.1, can handle project plans and management and give the user the flexibility to select different alternatives from a list of available menus. The project manager, NOT the computer, is still responsible for planning and must make decisions based on information supplied by the computer. Com- puter output is only as accurate as its input, which is supplied by people.